The devil is literally in the details of a new Nintendo Switch bundle featuring Blizzard’s legendary game Diablo III: Eternal Collection, launching exclusively at GameStop on Nov. 2. 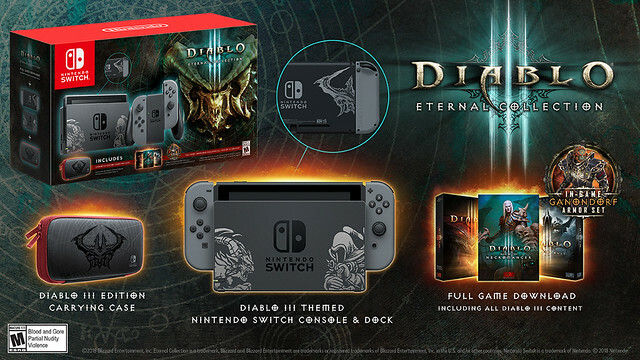 Fans who pick up the devilish bundle will receive a Nintendo Switch system and dock featuring Diablo III artwork, a download code for the Diablo III: Eternal Collection game and a themed carrying case, all at a suggested retail price of $359.99. Diablo III: Eternal Collection contains the full classic game, as well as all of its expansion content: Rise of the Necromancer and Reaper of Souls. In addition, fans who play the Nintendo Switch version will receive in-game items that are only available on Nintendo’s hit console. These in-game bonuses include a variety of items from The Legend of Zelda series, including Ganondorf Transmog Armor, a companion Cucco pet and a Golden Triforce Portrait Frame. In Diablo III: Eternal Collection, players choose between one of seven classes, including Barbarian, Crusader, Demon Hunter, Monk, Necromancer, Witch Doctor and Wizard, to set off on a dark and memorable adventure to destroy demons and discover loot. The critically acclaimed game is hailed for its style and gameplay, which is perfect for playing on the TV or on the go using Nintendo Switch. For more information about Diablo III: Eternal Collection, visit nintendo.com/diablo-3-switch. I'm a sucker for Diablo 3 and even though I've played to death now, this is making me think about buying a Switch. Would be the 3d copy of the game for me too on top of PC and PS4. Blizzard knows how to milk it. This seems like a bundle I would jump on but IDK rumors of an upgraded switch out by summer time have me in more of a wait and see mode. Sure, I'll get it if it comes with a controller too. I'm not buying a system at that price that doesn't come with at least one controller. I comes with two joy cons. 2. @karaliusbronius it does come with a controller, you just sort of build it by need, either you hold the joycons in each hand, or you attache them to form a complete controller. Look at the picture of the switch, look on the switch package and to the right of the image of the switch, you can see the controller being assembled as the right joycon is inserted and the left is already in place. From experience I can say it works great, Nintendo did some fine craftsmanship here, too bad buying a 2nd set is so expensive. I think he means the pro controller. I. E. a real controller . I have played the switch at friends and familys house and the the joy cons are not great. If you are a child or have small hands it's probably not a big deal. For some of us with large hands it is uncomfortable to use joy cons. The switch comes with a little frame you can put the joycons in, which is roughly like a 'real' controller. The joycons themselves are dreadful tho, at least in my hands, so I had to buy an extra controller anyway, so the wife and I could play without cramping my hands! Diablo on the switch... doesn't seem like a great fit to me, I mean, Diablo requires internet from a device which only has wifi? I guess it is fine if you don't use your switch out and about. While the individual Joy-cons are pretty friggin' tiny, when you put them in the grip (which pairs them as one controller, essentially), it's not so bad. I prefer the pro controller, but the grip is sufficient enough, speaking as someone with larger hands. Even on the grip, because of how close the joycons are to each other, it is still uncomfortable to use. I bought a Pro controller pretty much immediately after buying a Switch because long sessions were just painful, and I have medium sized hands. As for the Switch, I would really wait for the next generation to come out. It will be two year's old this Spring, and Nintendo likes doing refreshes of their handhelds (the Switch definitely is). So I wouldn't be surprised if a better version with at least a better battery life comes out next year. And by then, the Diablo game will be cheaper. So win win. How many Switch bundles do we actually need at any given moment? And yeah, "upgraded" Switch on the horizon. Upgraded so you can't hack it. That would require going with an entirely different processor, essentially. It's a problem inherent to the chip they opted for. The excuses some of you come up with for bad design is hilarious. They will not waste their money on OLED. Even Sony dropped OLED from the Vita, and that was one of the saving graces of that system. Can't imagine going back to D3. So burned out on it. Left ages ago. I used the grip. It is not a good design. The fact that the pro controller exists is somewhat an admission that the joy cons are not for everyone. Of course joycons are not for everyone, but still, amazing design in my eyes, I was truly amazed when I learned how to use them. At first thought "too small" but I actually play with them quite easily and have lots of fun. As for the issue of needing a pro controller, there's a much cheaper solution than buying pro controller for freaking 60$, there are usb wireless adapters which allow you to pair an xbox or ps4 controller (and other controllers) to your switch, it also works on pc and ps3. each costs about 20$ and they work great (according to reviews, didn't get mine yet), look for "mayflash ns". You have usb to network adapters for that, 15$ or so, so you get stable wired internet if you need that. you can also use it for other devices so its worth having in general. There are rumors for revised switch to come out 2019, one claims 4k switch with streaming, the other about a console with 8gig ram instead of current 4 and a small upgrade to the processor. Time will tell.